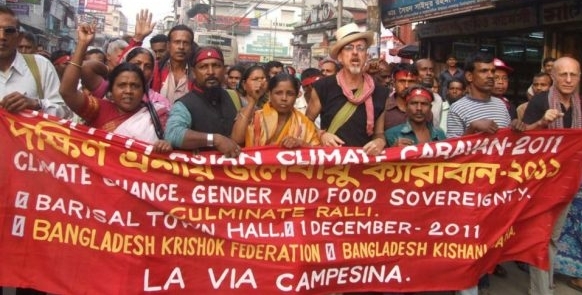 Friends of Bangladesh (formerly Bangladesh Peasant Solidarity Network) is an Australian solidarity group to the Bangladesh Krishok Federation & Bangladesh Kishani Sabha. Our goals are to raise awareness and funds for the great work that these brother and sister organisations are doing in Bangladesh for peasants, indigenous people and the landless. They work primarily for food sovereignty for these people. The BKF and BKS have facilitated numerous land occupations that have enabled people to have autonomy over their lives and livelihoods. They are working towards large scale agrarian reform through rallies and awareness raising, mobilisation of communities and through lobbying the government. At an international level they also advocate for Climate Justice. Climate Justice is incredibly important in Bangladesh as it is a country that is one of the most severely affected by climate change related impacts. These impacts, such as extreme weather events, have already taken the lives of thousands of people. While this occurs, the global elite advocate for false solutions to climate change which at best, fail to mitigate emissions and at worst reduce Bangladesh’s resilience and ability to adapt. Their work is hopeful and inspiring and sets an example of how people power can triumph over global systematic oppression.